September is Pain Awareness Month. That is why we want to highlight what it’s like to live with the pain you experience — because it can be difficult for others to understand someone else’s pain, and not all pain is the same. What does your pain feel like? How would you describe it to someone who has never experienced chronic pain? What do you wish others knew about your experience with pain and the challenges you deal with? Share your thoughts, ask questions and respond to other pain warriors by posting on The Mighty using the hashtag #ExplainMyPain. If you want, add a title for your thought in the Title field. Make sure to include the hashtag #ExplainMyPain. Write your response in the Your Thought field. Don’t forget to include hashtags related to your response (#ChronicIllness, #RareDisease, #Fibromyalgia, #Lupus, etc.). Including hashtags in your post will make it more likely that the people who follow that topic get to see what you share. Start by typing # then type the hashtag you want to use. You can select an existing hashtag or create your own. When you’re finished writing your response and adding your hashtags, select the Post button inside the pop-up window to finish sharing your thought. See the responses to Haley’s post and add your own response here. 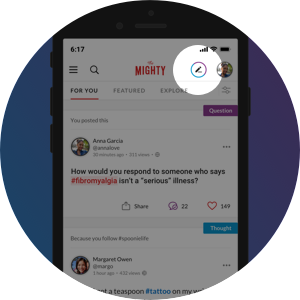 Your response may be shared on The Mighty’s Facebook, Twitter or Instagram account. View all of the #ExplainMyPain posts here. This pain scale doesn’t always do the pain we experience justice. That is why we’re asking members of The Mighty community to reinterpret the pain scale using words, images, or both words and images. We’ll be sharing these images on our social channels and compiling them as resources for others to help them better explain their pain to others. Note: You will be credited for your artwork. Share your social handles or website so we can link to more of your work. 3. Share a video of yourself answering the question: What’s one thing you wish people understood about your pain? The patient perspective is left out of the chronic pain discussion far too often (especially as it relates to the opioid crisis). But without listening to pain patients themselves, doctors and lawmakers are missing a crucial perspective and may end up making decisions that make life harder for people with chronic pain. So we’re asking you to send us a video of yourself answering this question in 15 seconds or less: What’s one thing you wish people understood about your pain? We will share some of the videos on The Mighty and The Mighty’s social media channels. Answer the question in 10-15 seconds. You can send us more than one video! Please send your video(s) to [email protected] with the subject line Pain Awareness Response. The Mighty wants to show the world what having pain really means. Pain itself is often invisible, and we hope to make people more aware of what living with constant or chronic pain is like by showing it as a visual representation through paint on a body. The Mighty is looking for participants in the Los Angeles area who would be comfortable on camera talking about their pain as well as having the pain areas physically painted during filming. If you’re in the Los Angeles area, complete this form for an opportunity to participate. People who haven’t experienced chronic pain don’t always see what you go through every day. Pain Awareness Month is a great time to share the reality of your life, hopefully increasing understanding of the challenges you deal with. Perhaps, if the chronic pain community works together, we can help friends, family, coworkers, doctors and lawmakers show more compassion towards the pain warriors in their lives. We encourage you to choose at least one way to get involved and raise your voice this month. We can’t wait to share your story.